Mersal is being released in Telugu as a dubbed version titled Adhirindhi and recently the teaser was released by the makers. Thalapathy Vijay’s upcoming film, Mersal, is currently the flavour of the season and much is being spoken about the film’s grandeur and the scale it is being made on. The teaser of the film was recently released by the makers, Sri Thenandal Films, and fans erupted out of joy on social media looking at the teaser which seems nothing short of a Vijay mass entertainer. Directed by Atlee, Mersal also stars Samantha Ruth Prabhu, Kajal Aggarwal and Nithya Menen as the leading ladies since Vijay will be seen playing triple roles in the film. A lot is being spoken about the film and the way Vijay has gotten into each character in Mersal, and the latest one to add to the buzz is Baahubali director SS Rajamouli. Mersal is being released in Telugu as a dubbed version titled Adhirindhi and recently the teaser was released by the makers. Being presented by Sharrath Marrar, the teaser received a huge response in Telugu too and has now become the most spoken about. 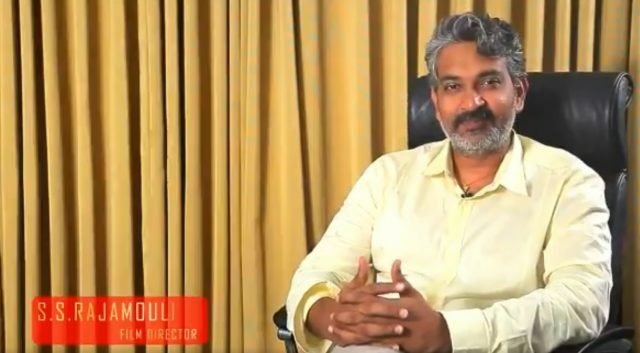 Rajamouli spoke in video about Adhirindhi after the teaser was released and appreciated the way the film was being promoted.